effie2, ChemicalHelena, DawnM74 and 1 others like this. Arrogant idiot fossil almost killed a mother and her baby!!!!! Police launch investigation into Prince Philip crash as it's revealed 'shaken' royal, 97, asked mother and baby 'Is everyone else alright?' after he was pulled through roof of Land Rover - but where were his royal protection officers? Police are today investigating the Duke of Edinburgh's role in a horror car smash involving a baby and its mother as it was revealed the Queen's husband was able to walk over and ask them: 'Is everyone else alright?'. 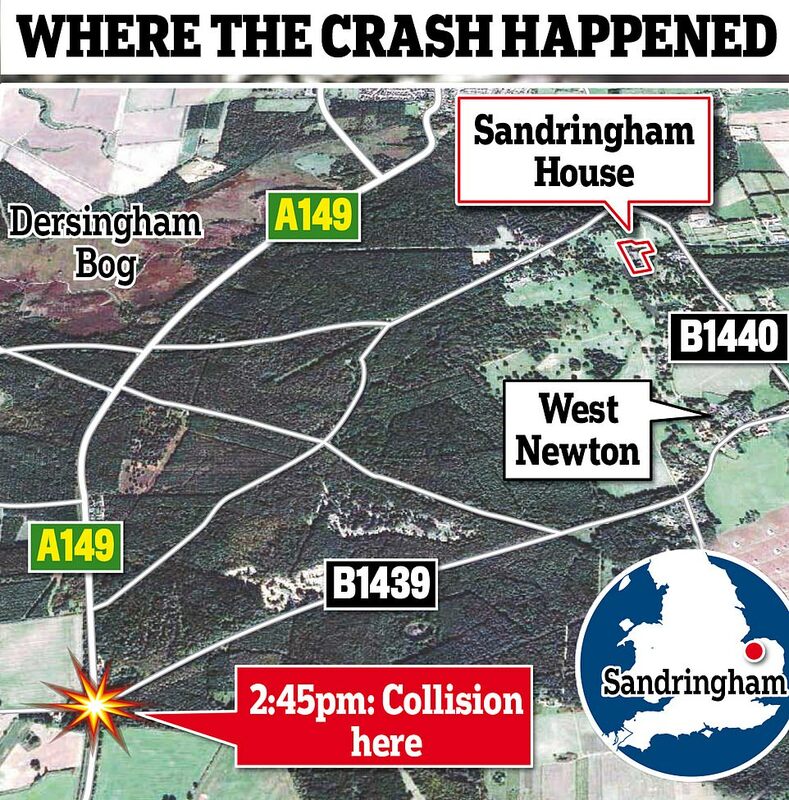 Barrister Roy Warne pulled Prince Philip, 97, from the wreckage of his Land Rover and said the royal told officers he had been 'dazzled by the sun' before the collision near the Sandringham Estate in Norfolk at 2.45pm yesterday. 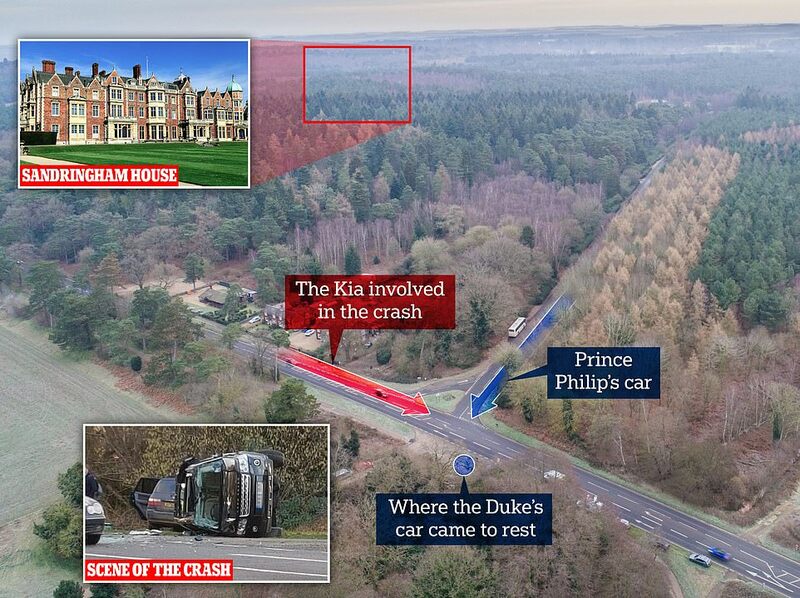 Norfolk Police told MailOnline today they are treating it like any other road traffic collision, meaning they are likely to question the Duke once he is recovered. A force spokesman said: 'The incident will be investigated and any appropriate action taken'. The Queen will be 'very annoyed' with her husband, according to royal expert Ingrid Seward, and Prince Charles said recently he was 'always worried' about his father's determination to keep driving well into his nineties. If Philip was at fault for the smash he could be prosecuted for driving without due care and attention - but could avoid court by surrendering his driving licence, 'Mr Loophole' Nick Freeman has said. 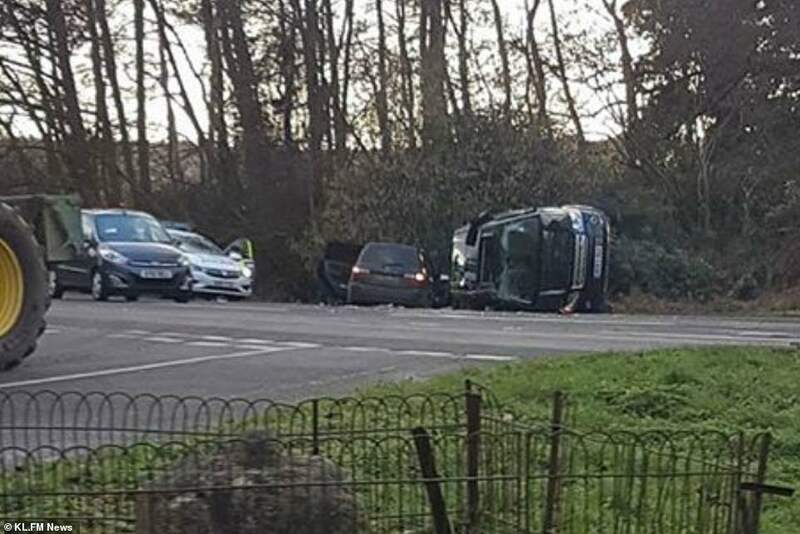 Despite the ongoing police investigation a new Land Rover Freelander was delivered to Sandringham today, suggesting Philip is not ready to give up driving just yet. The crash also raises major security questions after it emerged there was no royal protection officer in the car with him - but it is understood the royal's bodyguards followed in a car behind. Roy Warne, 75, was driving home from hospital with his wife Victoria, 72, who had just been given the all clear from breast cancer, when he saw the Duke's car 'tumbling across the road'. Mr Warne said: 'He [Philip] wasn't rude. He was very shaken and he went and asked: 'Is everyone else alright?'. He's a very brave man. He didn't make a big fuss about it'. He added: 'He is lucky to be alive. I saw the Duke's car careering, tumbling across the road - it ended up on the other side, having rolled right over. It was an astonishing escape for everyone. People could have been killed. The impact was enormous'. Mr Warne said he wasn't sure where the Duke's security detail had been but added that police arrived on the scene in a different car 'very quickly', once he had pulled Philip out. Philip is believed to have pulled out of a side-road, coming from Sandringham House, on to the busy A149 where the Kia, travelling at up to 60mph, struck his side of the 4X4 in a so-called 't-bone' smash. 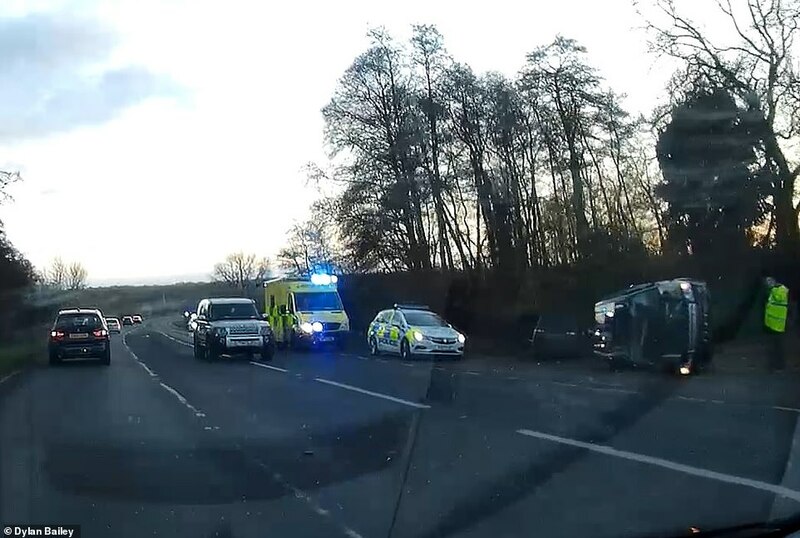 The Land Rover was flipped on to the passenger side, and then slid across the carriageway before 'somersaulting' back on to the driver's side and coming to a halt on a grass verge. The Duke of Edinburgh collided with another car after pulling out into a main road, according to witnesses. If that was the case, he could be prosecuted for driving without due care and attention, which carries an unlimited fine, according to Nick Freeman, the lawyer dubbed Mr Loophole. But the 97-year-old royal would have a good defence if he blamed being blinded by the sun - as one witness reported - and could also avoid prosecution by surrendering his licence, Mr Freeman added. Mr Freeman, known for representing celebrity clients such as David Beckham, said it appeared the duke pulled out into the path of the other car in Thursday's crash near Sandringham. 'If he simply drove without due care and attention because of a relevant medical issue - because maybe at 97 you're just not as sharp as you would have been - and he's just made a mistake, which is probably what's happened - on the face of it he would be driving without due care and attention,' Mr Freeman said. According to Crown Prosecution Service (CPS) guidance, the offence of driving without due care and attention is committed when a person's driving falls below the standard expected of a competent and careful driver. The test of whether the standard of driving has fallen below the required standard applies both when 'the manner of driving in question is deliberate and when it occurs as a result of incompetence, inadvertence or inexperience', the CPS guidance states. The offence carries up to nine points and an unlimited fine based on net disposable income. There is a precedent for members of the royal family to be prosecuted for driving offences. Philip's daughter the Princess Royal was given a written warning for speeding on the M1 in 1972 and fined £40 after she was clocked doing 96mph on the same motorway five years later. In 1990 the Princess Royal was banned from driving and fined £150 for speeding by magistrates in Stow-on-the-Wold, in Gloucestershire, and in 2001 she was fined £400 after admitting driving her Bentley at 93mph on a dual carriageway. Mr Freeman said that before bringing any charges against the duke, prosecutors must weigh up whether they are in the public interest. Philip was pulled out of the sunroof by driver Mr Warne, who had stopped at the scene, and the Duke was breathalysed by police, which came back negative, and rushed back to Sandringham where he is recovering with the Queen by his side. He will be monitored by doctors for 48 hours for signs of concussion or internal injuries. The Duke of Edinburgh was clearly dazed after the crash but was uninjured, but two women inside the Kia were treated in hospital, one for a suspected broken arm, the other for an injured knee. The nine-month-old baby was unharmed. Mr Warne immediately pulled over to help, fearing that he would find the occupants of both cars dead or seriously injured. He first rushed over to the Kia which was partially in a hedge with smoke pouring from the engine, making him fear it would explode. Mr Warne said he immediately saw a baby boy in the back of the Kia with two women in the front seats. He said: 'There were two woman in the car and one of them had a broken arm and they were very shaken. 'One of them was the mother of the child and she was quite upset. The windows were down and with another chap, we got the baby out. 'My main concern was their car because there was a lot of smoke around it and I thought the tank might go up. Mr Warne of Thornham, Norfolk, said he then turned his attention to the upturned Land Rover without realising that it was being driven by Philip. 'I had no idea at first that it was him because I couldn't see his face. I helped him move his legs which were a bit trapped and a bit crushed, then I saw his face and I realised who it was. 'He didn't seem to be in pain and I don't think he was particularly concerned but obviously he was very shocked in the circumstances. 'It was obviously a horrendous accident. Its just amazing that people were not more seriously injured. 'The windscreen was badly splintered but it was still in place and I prised it from the corner and freed it from the joint. 'He was trapped. I asked him to move his left leg and that freed his right leg and then I helped him get out. I can't remember what he said but it was nothing rude. 'He spoke to me. I can't remember the words, but it was of a person who was obviously in some shock. 'He was a very old man and he was obviously very shaken up and he responded as you would imagine the Duke of Edinburgh would. 'He spoke to my wife and said he was dazzled by the sun. The sun was very, very low. It was almost at horizon level and it was very strong. How could Prince Philip be punished by police? Experts have said if the Duke is at fault the most likely offence he has committed is driving without due care and attention – also referred to as careless driving. The charge covers a multitude of motoring sins, from tailgating to tuning the radio. Defined in law as 'allowing the standard of driving to fall below that of a competent and careful driver'. The punishment may include an unlimited fine, points on your licence or disqualification from driving. 'I was wearing sunglasses and where he was coming from he would have been looking straight into the sun. I can understand how it happened. Mr Warne said Philip had been driving out of a side road from the direction of Sandringham House when he pulled out on the A149 road which has a 60mph limit. He revealed that police arrived on the scene in a different car 'very quickly', once he had pulled Philip out. Mr Warne added: 'I had his blood on my hands. It wasn't much and one of the Royal people gave me a wipe. 'I have read in the press that both of the drivers were breath tested and they were both negative, but I didn't see it happen. 'I didn't hear any discussion about him going to hospital, but I was told he was being taken to Sandringham House for assessment. 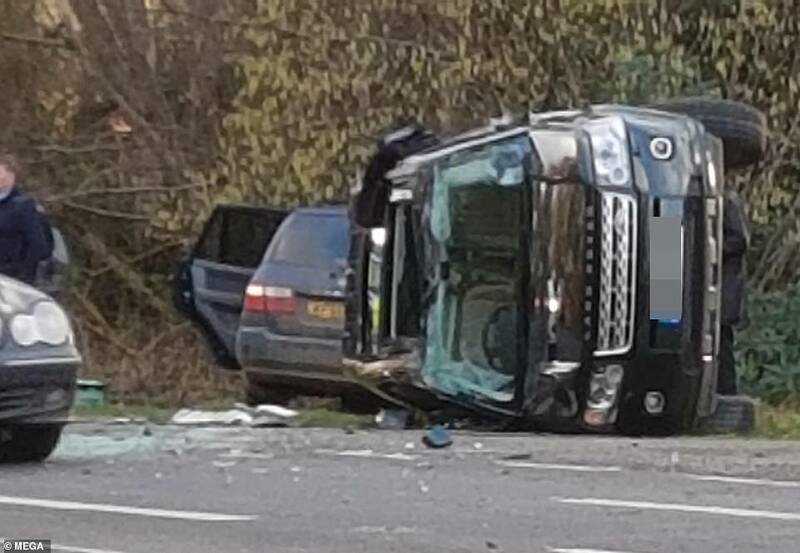 Images emerged of a black Land Rover Freelander 2 – which has a five star NCAP safety rating - having rolled on its side following the crash, where it was 't-boned' by a blue Kia. At least five police cars and two ambulances went to the scene. The Duke was seen by a doctor at his medical facilities on the Sandringham Estate as a precaution but was given the all clear. However, he will be closely monitored for 48 hours to ensure he has no internal injuries, according to reports. Mr Warne's account suggests there was no royal protection officer who with him, although some reports suggests there was one in the car, who was also uninjured. 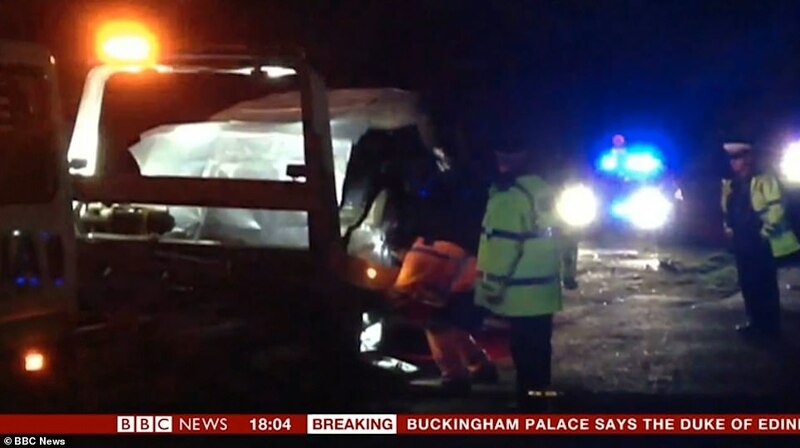 The Duke of Edinburgh and the female driver were breathalysed and both gave negative readings. 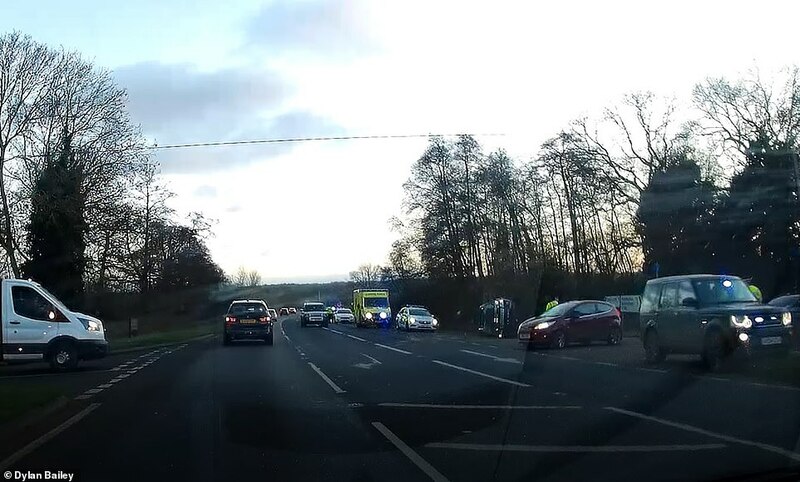 The crash happened on a stretch of the single carriageway road which has a 60mph limit and is a notorious accident spot. 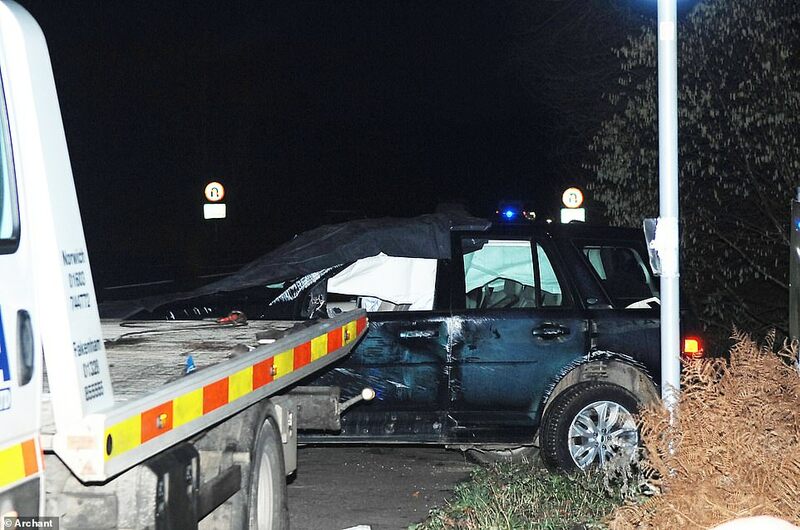 Philip's Land Rover was heading on to the A149 out of a private estate road leading from Sandringham House when he was 'dazzled by winter sunshine' and struck by the Kia, which was going south. The Duke of Edinburgh is from a generation when some people did not need to pass a driving test to obtain a licence, but he does have one, the Palace has said. He was born on June 10 1921 but compulsory testing for new drivers to obtain a licence was only introduced in Britain on June 1 1935. This applied to all drivers and riders who started driving on or after April 1 1934 - when Philip was 12. Philip lived in both Europe and the UK as a boy, and enrolled at Dartmouth Naval College in 1939. 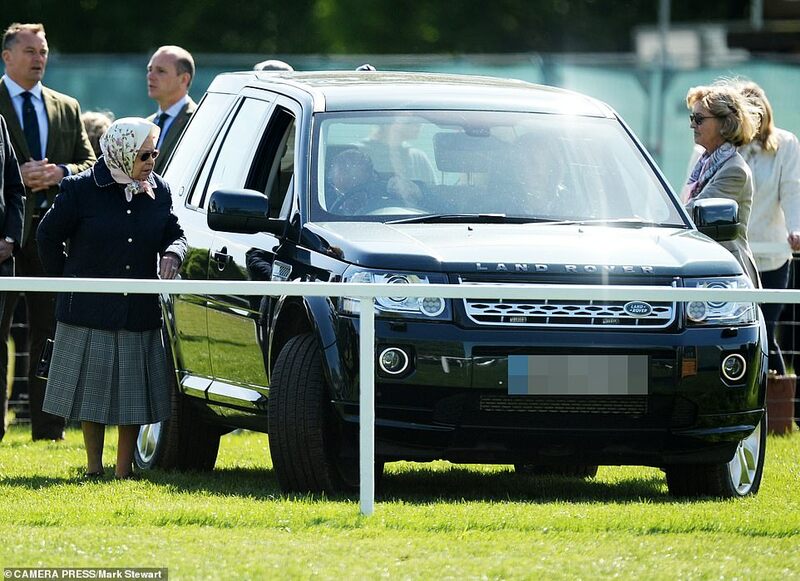 The Queen does not having a driving licence. She is exempt from the law requiring all other citizens to pass a test and hold a licence if they want to drive. The monarch learned to drive with the Army in 1945 when she was 19 after she joined the Auxiliary Territorial Service during the Second World War. She still drives herself around her estates. The impact on Philip's driver's side slipped the car on to the passenger's side before is spun over and slid across the single carriageway. After reaching the far edge, it then flipped again 180 degrees onto the driver's side before coming to a halt. A villager who asked not to be named said: 'It is an extremely busy road and it is a miracle that he was not hit by another car as well. Local driver Natalie Courtney Ely said she had experienced visibility issues on the same stretch of road in the past. 'I drove past about 10 minutes after it happened,' she wrote on Facebook. 'I'm surprised he wasn't hurt. 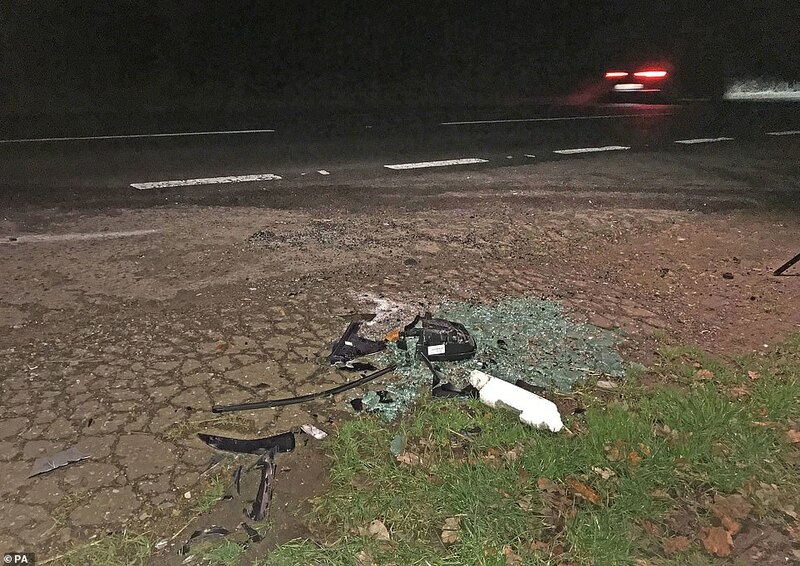 Broken glass and pieces of black bumper and blue trim from Philip's car was left piled up at the side of the road tonight. A turning off the A149 to the east leads to the village of West Newton, and a private estate road to the west leads past St Felix Chapel, a British Orthodox church. 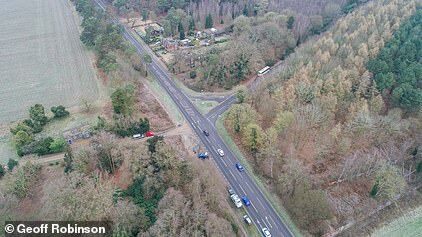 Astonishingly, the site is just 30 miles from where the Duke was involved in another crash 23 years ago, which wrote off a Mercedes and injured another motorist. Witness Nick Cobb arrived at the scene shortly after yesterday's collision. He told BBC News: 'A couple of cars coming towards us flashed their headlights. The first vehicle we saw was a Sandringham Estate Discovery police car, which is a plain car but with blue flashing lights. 'There was quite a bit of debris on the road so we had to go into the middle of the road and go past slowly. I saw a 4x4 on its side and a car next to it in a hedge. Six or eight ordinary cars all parked round with people helping, then just next to that a normal police car directing traffic. The Duke is expected to be intensely monitored by medics for the next 48 hours to ensure he has no internal injuries, such as a potentially deadly bleed on the brain. The Duke of Edinburgh continues to remain robust at the age of 97 - but has still faced a handful of health concerns in recent years. Prince Philip has been supremely fit since his Navy days and is understood to still walk or take the stairs whenever possible. 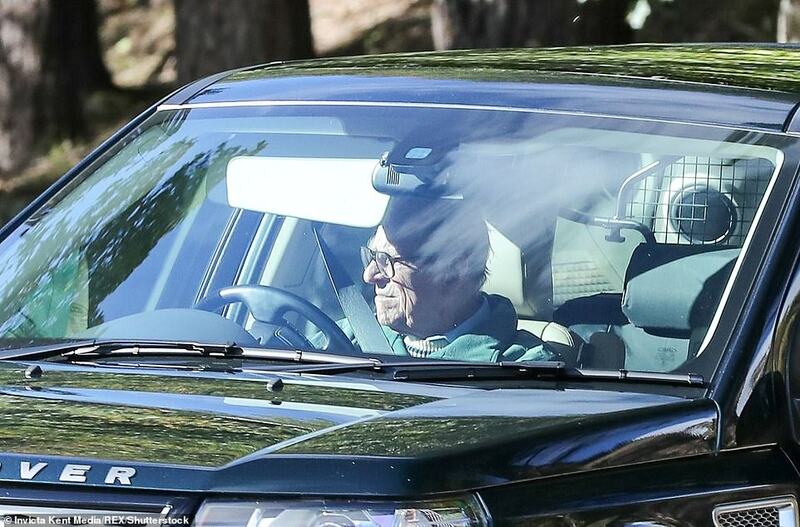 Since his retirement in 2017, Philip has maintained his independence through driving, whether it is a car on the roads around Sandringham, or a carriage through the leafy grounds of Windsor Castle, where he spends the majority of his time. Indeed the Duke was behind the wheel when his Range Rover collided with another vehicle near Sandringham on Thursday afternoon. While there is no suggestion that his health has played any part in the accident, it will no doubt prompt fresh concern surrounding his condition. The Duke of Edinburgh has encountered a handful of relatively minor health issues in recent years. Prince Philip was hospitalised in April last year and forced to undergo hip replacement surgery, although he has been seen carriage driving a number of times since. In June 2017 he was admitted at the urging of a doctor after a battle with a bladder infection. The condition forced Prince Philip into the hospital twice in 2012, including once after he stood by the Queen's side for a cold, rain-lashed Thames pageant marking Her Majesty's Diamond Jubilee. It flared up again two months later at Balmoral, necessitating five more days in the Aberdeen Royal Infirmary. Another woman drove past where the crash happened at around 3.40pm. 'Luckily it was just sort of on the side of the road, the road wasn't closed in any way. One man, who gave his name only as George, was driving through Sandringham when he saw a 'black Land Rover coming up on one of the junctions'. 'I saw who it was,' he told The Times. 'They often drive round the estate. I followed him up and when I got to the junction the car was on its side. With the Queen's consort in his 98th year there may be calls from some for the duke to give up driving. Prince Charles has previously revealed he was 'always worried' about his father's determination to keep on driving into old age. In 2014 he met Ivor Thomas, a D-Day veteran, whose 61-year-old son, Philip, told Charles that his father insisted on driving despite being in a wheelchair. Figures show that in 2018, the number of drivers aged over 70 referred by the DVLA for extra testing increased by 20 per cent. Under UK driving laws, people have to reapply for their licence once they turn 70. After that, they have to submit a new application every three years. But Edmund King, AA president, said: 'Young, predominantly male, drivers are much more likely to crash within six months of passing their test than older drivers within six months of hanging up their keys. 'Older drivers often self-restrict their driving by not driving at night and only driving on familiar roads. The Archbishop of York tweeted a prayer for Prince Philip following the accident. Measures to reduce the speed limit and install cameras on the road where the Duke of Edinburgh was involved in a car crash were approved this morning. The meeting of Norfolk County Council's environment, development and transport committee took place today in County Hall in Norwich. The scheme will see the speed limit on the length of the A149 (pictured today) between Knights Hill Roundabout and Snettisham lowered from 60 to 50mph. The Duke of Edinburgh's Land Rover rolled on this section of the road. Average speed cameras will be installed to monitor the new speed limit. Conservative councillor Martin Wilby, who chairs the committee, asked when the safety cameras would be put in place. 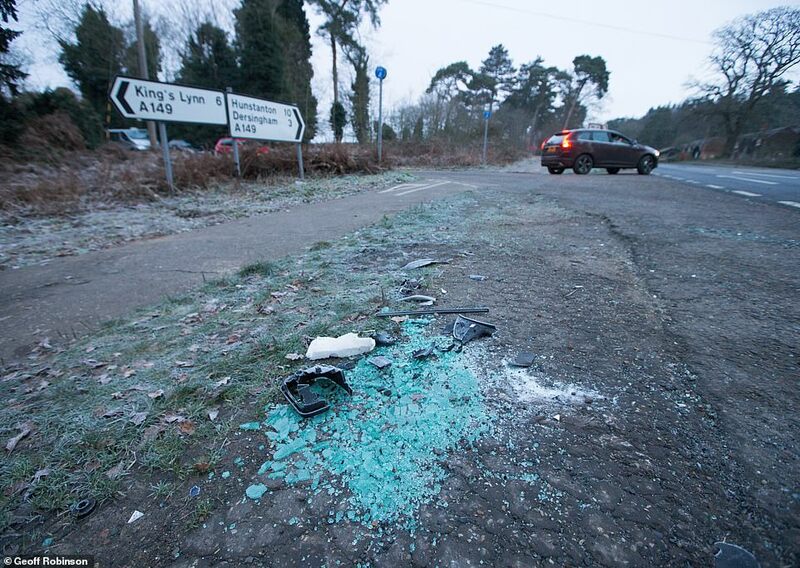 Labour councillor Terry Jermy said the numbers of injuries of the road had been 'highlighted repeatedly over years'. He added that a paramedic who had recently moved to Norfolk told him that they had never seen so many road accidents until they moved to the county. Cllr Jermy added: 'I hope some good may come from it. Labour councillor Colleen Walker said: 'I would like to wish everyone involved in yesterday's accident a speedy recovery. Norfolk Police said officers were called to the A149 at Sandringham just before 3pm on Thursday after a Land Rover and a Kia were involved in a collision. 'The male driver of the Land Rover was uninjured. The female driver of the Kia suffered cuts while the female passenger sustained an arm injury, both requiring hospital treatment,' the force said. 'We can confirm both casualties from the Kia have been treated at the Queen Elizabeth Hospital in King's Lynn and have since been discharged. The road remained open and both vehicles were recovered a short time later. Buckingham Palace said: 'The Duke of Edinburgh was involved in a road traffic accident with another vehicle this afternoon. The spokeswoman would not comment on suggestions Philip was travelling with a passenger, who is likely to have been his close protection officer. The Prince is known to regularly drive himself around the 20,000-acre estate which has been his main home since his retirement was announced. He was pictured enjoying a solo spin around Balmoral as recently as September last year. The Duke has been staying with the Queen at Sandringham since Christmas. He retired from public life in August 2017 after completing 22,219 solo engagements since 1952. Philip has encountered a handful of relatively minor health issues in recent years, including undergoing a hip operation in May 2018 and suffering a bladder infection the year before. He most recently prompted speculation surrounding his health when he chose not to join the rest of the Royal Family for the traditional Christmas Day church service at Sandringham. He was last seen at the Queen's annual festive lunch at Buckingham Palace in December. The condition forced the Duke into hospital twice in 2012, including once after he stood by the Queen's side for a cold, rain-lashed Thames pageant marking Her Majesty's Diamond Jubilee. Philip married Elizabeth in 1947 and has been by his wife's side throughout her long reign. In November 2017 Philip and the Queen marked 70 years of marriage, their platinum anniversary, with a black tie dinner for friends and family at Windsor Castle. Since his retirement last year, Philip has had more time to enjoy carriage-driving, which has been one of his favourite past-times since the 1970s. He raced carriages near Norfolk before going on to represent Britain at several world and European championships. The now discontinued Freelander was given a five-star safety rating when it was crash-tested by independent safety body Euro NCAP. ■ It has seven front and rear safety airbags to protect the driver and passengers, including a driver's knee airbag. ■ A safety report praised the way its steering column moved forward, creating more space for the driver, when it was tested for a front impact crash. But the Duke has not been immune to other scrapes. He was involved in a crash which wrote off a Mercedes and injured another motorist 23 years ago – just 30 miles from his latest accident, MailOnline can reveal. 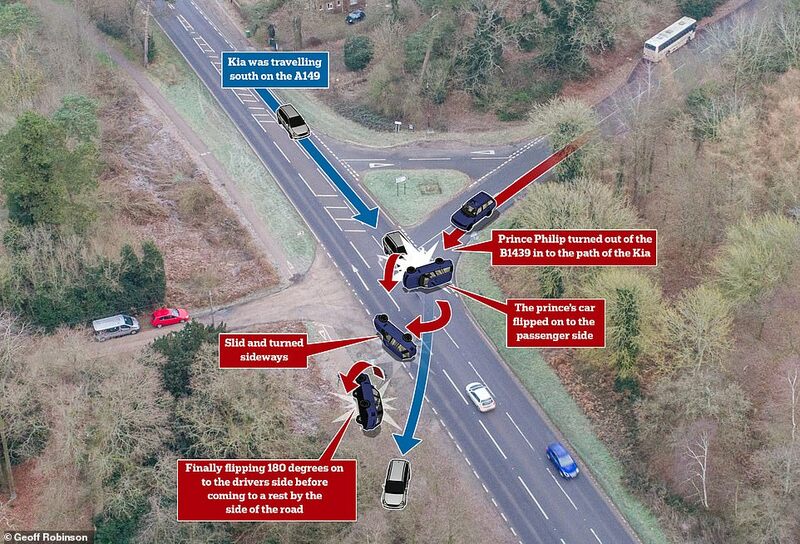 The collision, which took place on a cold January morning in 1996, has echoes of today's events in which the Prince was involved in a collision near his Sandringham estate. Patrick Daynes, then 48, had been driving through Brandon, Suffolk when - after stopping at a pedestrian crossing - he experienced the Duke's Range Rover smash into the back of his Mercedes. Then in 2010, he injured his ankle when his horse-drawn carriage hit a tree stump on the Windsor Estate. Tonight, Mr Daynes, 71, described the shock incident to MailOnline, saying: 'The Prince's Range Rover came into the back of my Mercedes while I was waiting at a pedestrian crossing. A female groom who was in the carriage went to hospital with an elbow injury. The Duke of Edinburgh's collision near Sandringham yesterday raises major security concerns and is a breach of protocol, experts have said. Roy Warne, 75, the man who pulled the Queen's husband out of his written-off Land Rover, has revealed there was no royal protection officer in the car with Prince Philip when he crashed with a Kia. But outside the gates of their private estates the royal family should always have a bodyguard next to them, Princess Diana's former security chief Ken Wharfe has said. Mr Wharfe, who served in the Met for 35 years, told MailOnline Prince Philip has a reputation for giving his police protection officers the runaround and has been known to tell them: 'I don't need you - leave me alone'. He said: 'The Yard has questions to answer because officers need to be able to stand up to him - I'm convinced that if a PPO was in the Land Rover with him the crash wouldn't have happened'. He added: 'The Queen may drive alone on the estate from time to time but she would never leave the gates without an officer with her in the car an back up behind. 'She was be absolutely livid - firstly through concern for her husband and second that there have been two people injured with a baby on board and it could have been much worse'. Mr Wharfe, a former SAS trained officer who Prince William and Prince Henry affectionately called 'Uncle Ken', protected their mother the Princess of Wales from 1987 to 1993. He told MailOnline today: 'The Duke of Edinburgh is known to be very difficult when it comes to personal protection officers (PPO), especially in a holiday environment like Sandringham. 'I know he would say things like 'I don't need you, leave me alone, I'm fine on my own' - and could take off without them. 'I suspect he has decided to drive to see a friend off the estate and just left. The security team will have been forced to jump in a car, followed and then be completely horrified as they came across the crash. '99 times out of 100 nothing would happen of he went on his own - but when it does go wrong it's often a complete disaster, as proved here'. Mr Wharfe said previously senior royals each had their own personal protection units - but this has been changed to a rota system where officers are allocated to different members of the royal family. He said: 'In the past you would have officers with decades of experience who would know how to deal with the Duke and convince him they should be with him when he drives. That's all gone'. RICHARD KAY: There's only one person who can tell Prince Philip to stop driving... but will the Queen dare? Somehow it was typical of Prince Philip yesterday not to wait for paramedics after clambering from his overturned car. Instead, it was only when he was back at Sandringham that he was examined by a doctor. According to official bulletins from Buckingham Palace, he was not hurt in the accident, which happened on a road bisecting the Norfolk estate. But eyewitnesses reported that he was 'very, very shocked' and shaken. That he seemingly escaped uninjured will naturally be a source of great relief not just for the Queen and the Royal Family but for the country, too. Once again, he appears simply indestructible. Nothing it seems can dent his durability or his indomitable spirit. But now questions will inevitably be asked about the wisdom of a man of 97, however proud and physically robust, taking the wheel of a powerful car. Once it was confirmed that the Duke of Edinburgh was alive and well, it didn't take long for admirers to crack jokes on social media. Others praised the duke for taking our minds off the political turmoil. Philip's obstinacy is famously matched only by his boldness. This, remember, is a man who still enjoys the thrills of hurtling around a carriage-driving course decades after most of his contemporaries retired. He has always held strong views on the nature of risk, and is certainly not foolhardy. But this accident poses questions not just about the Duke of Edinburgh's welfare, but what he represents for other road-users. In short, is the Prince now at an age where he could be considered a danger to motorists? However good a driver he is — and one of his former bodyguards tells me he always considered him among the safest and most responsible royals to get behind the wheel — it is demonstrably true that as we age, our reaction speed diminishes. Our hearing, too, is not as pin-sharp, and the eyesight starts to fade. And little more than six months short of his 98th birthday, Philip must be one of the oldest motorists in the country. There comes a time in most people's lives when the responsibility of age should make them take a long, hard look in the mirror, for the sake not just of themselves but of others, too. Two years ago, Philip did just that when he decided he wished to stand down from official life. Now, surely, he must consider taking another step to accommodate the march of time. The fact is he does not even need to drive. He has the round-the-clock presence of police bodyguards and access to any of the royal chauffeurs. Or, if that doesn't suit, one of his valets or even a friend could assume the duty of driver. The problem, of course — as all those who know the Prince will testify — is his sheer bloody-mindedness. Indeed, the fact that he escaped yesterday's scare in his two-ton Land Rover Freelander might, if anything, embolden him to keep driving. So if Philip himself will not surrender his driving duties, who can possibly tell him to stop? No courtier, however bold, would dare. The answer can only be the Queen. Were she to do so, then Philip, who has spent every minute of their 71 years of marriage obeying his wife, would surely agree. Of course, that, too, throws up an intriguing possibility as to whether the Queen would actually press her husband to pursue a course he manifestly doesn't want to. 'The reason their relationship has worked so well for so many years is that neither has forced the other to do something,' says a former lady-in-waiting. For decades, Philip has put duty first, whatever the cost. During the Queen's Diamond Jubilee, it meant shivering without a coat in the rain for four hours during the Thames river pageant. It was Philip, a brave young wartime naval officer, who particularly wanted a waterborne tribute to his wife of 64 years, and the Queen was happy to do it his way. It must have occurred to palace advisers that for this couple of such great age to spend the entire time on their feet was at least unwise and at worst, foolish. But Prince Philip is stubborn, and while fit young people all around this upright, elderly man wilted in the long hours of a wet and chilly afternoon on the river, he stuck to the business at hand. The upshot was an infection and a stay in hospital. It was partly because of that experience that the prince decided to retire. 'The spirit is willing, but the flesh is weak,' he laughingly told one retainer at the time. But Philip was never going to adapt to the standard format of retirement. He likes his independence too much for that. And nothing illustrates that independence more than the freedom of the open road. Both he and the Queen adore the chance to get behind the wheel whenever they are on the three big royal estates — Windsor, Balmoral and Sandringham. 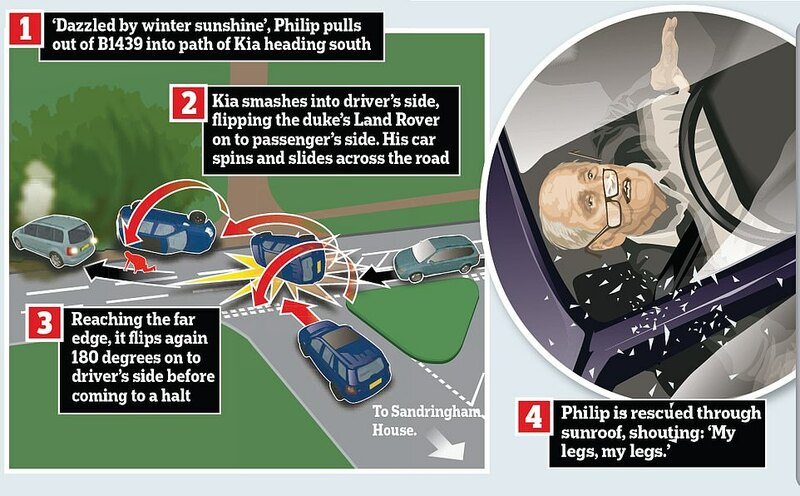 Philip's only concession is to use his seatbelt — which mercifully he must have had on yesterday. The Queen, on the other hand, often motors about the private roads on the estate without buckling up — as she is quite entitled to do. For Philip, the car represents an escape from the formalities of royal life. In the early days of his marriage, he liked nothing more than to speed off in his two-seater sports car. Since retiring, he likes to potter around in one of the estate cars. And if he can do so on his own, so much the better. Just before Christmas he drove himself to the Sandringham sawmill, where estate Christmas trees are sold to locals. 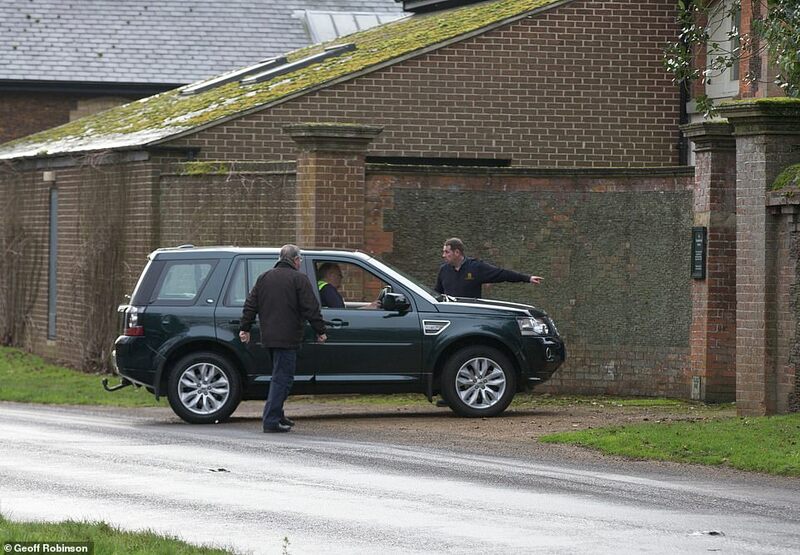 And a few days before that, while still at Windsor Castle, he was seen driving on the estate's back roads. His view is uncompromising — as long as he is in good health, physically and mentally, he sees no reason to stop driving. He is a mixture of robust common sense and impetuousness, a man who tends to laugh off concerns about his safety while haring across the countryside with reins in hand, for example. After a driving career almost eight decades long, Philip has inevitably had the odd prang. Twenty-three years ago, he was involved in a minor shunt while driving in Brandon, Suffolk, after apparently colliding with the back of a Mercedes. Neither he nor the other driver were hurt, and there were no court proceedings. Yesterday's accident was clearly of a more serious nature. But will it lead to a royal change of mind? For Philip, the motor car has been an essential part of his life. His very first car was a 1935 Standard which ended up in a private collection in Sri Lanka. He never forgot it, and during a visit to the country in 1956 he tracked it down. Despite being remarkably fit for a man barely two years away from his century, the Prince is not as mobile as he once was. Even so he can — and often does — walk to the stables at Windsor, where carriage-driving ponies are housed. At Sandringham, where he often spends time at Wood Farm, there is little need for a car. Since the New Year, Philip and the Queen have been together at Sandringham — she is due back in London after observing the anniversary of her father King George VI's death (and her accession to the throne) on February 6. Philip may return with her, or more likely remain in Norfolk a little longer. The night before the accident, the couple gave a party for estate workers and today they will be hosting a group of Prince Andrew's friends, who are arriving for a shooting weekend. Normally, Philip would get behind the wheel to follow the guns during the course of the shoot. After yesterday the question is, will he? Or will the accident mean that Philip sacrifices one of his last remaining indulgences? Having escaped serious injury, his family — and the nation — will be wishing that he does. I mean seriously they can get people to drive them. Get him out from behind the wheel of a car. Mivvi21, Bluebonnet, DawnM74 and 1 others like this. Royals dont need a driving license,they are above the law!Who can tell the old man he wont drive anymore ?A new car is already delivered for him! Is this true? Or are you pulling our legs? Only the queen doesn't need a licence. Only the Queen - everyone else, including Prince Phillip, must be licensed - and when Charles/William/George become king, they will already have their licenses, so the Queen will probably be the last monarch without one. Brookie, Sarzy and teforde23 like this. Yep. It's only the Queen who is above the law. ok,so it is the queen only...but do all seniors in the uk drive until they die,no tests,no license renewal?or is it just him? They have to start being checked when they are seventy, I think? You have to renew your license every 3 years after you are 70. Same goes for him. Bluebonnet and lindsaywhit like this. I don't like reading that his new car was already delivered. I hope he delivers a new car to the two women and baby. The winter sun has been very low and bright this week but all the more reason to pull out of a side road with caution. I also read somewhere that they are reducing the speed limit of the main road from 60mph to 50mph as it is an accident blackspot. Princess Anne was asked how her father was doing and she said she didn't know anything. They are playing it down but this was a pretty serious collision to flip a Land Rover like that. He was very lucky he wasn’t injured. Rumour has it he’s gone completely gaga these days and lives on a farm on the Sandringham estate, presumably with a team of minders. He probably sneaked off in the car when nobody was looking. I doubt he’s an easy patient. rollo, Brookie, teforde23 and 3 others like this.